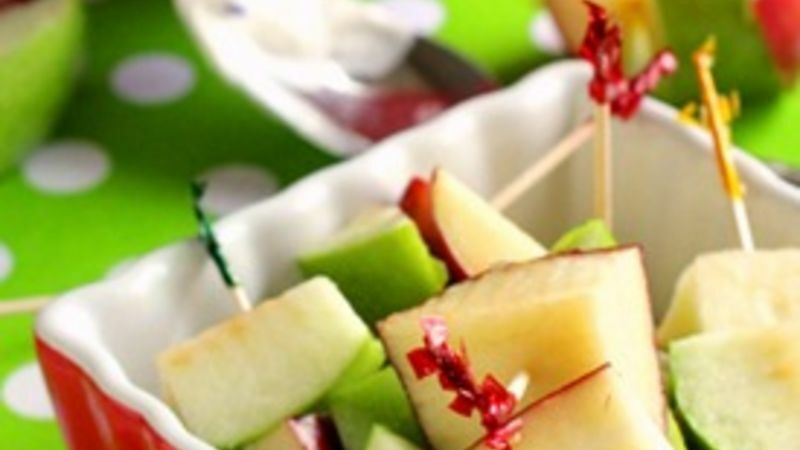 Thread the diced apples on small skewers or toothpicks. Or, serve with fondue forks for dipping. In a large bowl, stir together the Yoplait® yogurt, whipped topping, cinnamon, and nutmeg. Serve with apples for dipping. Enjoy! There's nothing like welcoming home your tots from a long day at school with a table full of after-school treats. They've been working hard, flexing their little brains, so what better time to surprise your kids with a colorful spread of healthy yummies? Our family loves fondue. It doesn't matter if I'm serving it up to toddlers or teens, kids of all ages find it ridiculously fun to dip stuff in stuff. In this case, we dip simple diced apples on toothpicks into a whippy, Cinnamon-Vanilla yogurt dip. The dip tastes equally delish with strawberries and bananas and teensy hunks of angel food cake or graham crackers, but why not keep things easy and celebrate with apples? After all, apples store well for days in your fridge, make a healthy and colorful addition to any snacktime, and are the perfect symbol for school-time success. Which is exactly what your kiddos will be enjoying after a mama as smart as you feeds them a nutritious, fun-to-dip snack like this one. You go, Mama! More Snacks that Earn an "A"
For even more ideas, bop on over to our collection of Healthier Snacks recipes and check 'em out! What's your kids' fave after-school snack?